Art = Life at R.L. Delight Fine Art: First week of School, Done! First week of School, Done! OK, I know this doesn't look like much and the drawing is a challenge to photograph. 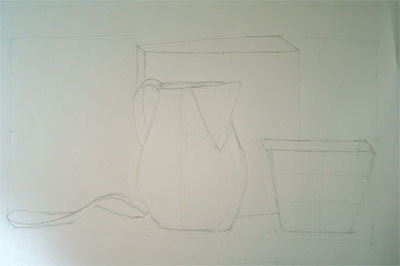 This is one of the still life drawings we did this week. At this point we are starting from the beginning. We are just trying to get the shapes in the right proportion and position. We are not adding shadows except to block them in to help us in positioning. We are learning to train our eye and mind to ask the proper questions to accurately get things down on paper. The types of questions are, "is the object on the paper proportionately bigger or smaller than the real object." I say proportionately because scale (overall) doesn't play much into the drawing at this point. "Is the angle of the edge greater or smaller?" "Do the centers match up?" And so on and so forth. It is amazing when you think you have it and the instructor sits down and begins to ask you these questions. You look and all of a sudden you can see that yes, you made the basket too large, the angles are too sharp, etc. The teacher tells us that our eye and mind already know the answer, we just have to ask the right question. So we are learning how to ask the right questions. It is harder than it seems. In retrospect, the questions seem so obvious and simple, but when you are focused and rendering the drawing, for some reason they are harder to ask. It does get easier though. With each one I learn to ask more questions and can "see" the answer on my own. I've had to start over more than once! Friday class was wonderful and exhausting. We had gesture sketching in the morning session. All of us students, in every year, gathered with our easels in a large circle and a live model in the center. Our objective was to capture the "gesture" of the pose. No detail, just the rhythm and sense of movement. We started with one minute poses then went on to three, five, and ten minute poses. This was over a three hour time period! It was mentally and physically demanding. We had breaks and all of us usually flopped into a chair and shook out our hands, arms, and shoulders. I really enjoy this exercise. There is music going to keep up the energy and the focus in the room is so intense. The only other sounds are the sound of pencils and charcoal moving over paper and the constant beep (or so it seems) of the timer. It was a good week. I am loving it. As I have mentioned before, I feel as if I have come home. The work is hard but extremely satisfying. One final addition is a link that I found very interesting. It is to a trailer for a documentary that hits very close to home to me personally, and other women artists. It is called "Who Does She Think She Is". It isn't very long and you can see it here. I will also put it in the links list. Congrats on your first week of school! The drawing classes sound intense....but that must be what it takes to be able to draw reliably and well. I'm intrigued by that movie. I missed my chance to see it when it was in theaters....but hopefully I'll get a chance sooner rather than later. Hey Sue, the movie isn't in wide distribution yet. In fact I contacted them because there is no screening in Oregon (I think) let alone southern Oregon. I am going to see if I can find someone at SOU who may be interested in getting a screening going. You can check the link I put up for current screenings to see if there are any in your area or, the home DVD comes out next month. Perhaps your local library will pick it up. I will be able to say more about it once I see the movie! Week Three, Adding a New Layer.